The EDC Tool Roll is a new feature on Jerking the Trigger in which we profile various every day carry worthy tools. The tools shown won’t be multi-tools but rather real tools, that by virtue of their compact size, light weight, usefulness, or unique functionality, can find a place in any range kit, emergency kit, or every day carry bag. Feel free to comment on the tools that you carry so we can all learn! German tool manufacturer, Knipex, makes a number of my favorite tools but their 5″ Cobra Pliers (87 01 125) are at the top of that list. These extremely compact pliers are extremely big on usefulness. I bought the Cobra Pliers because I was tired of the pliers on my multi-tools never quite being the right tool for the job. The 5″ (125mm) Cobra Pliers are only slightly longer than most multi-tools in the folded position but they boast all the same features as Knipex’s larger pliers including drop-forged steel construction, push-button adjustment, and hardened jaws that self-lock into nearly anything you are trying to turn. They are just under 5″ in length and just under 3 ounces in weight. This makes them easy to carry in pocket, small bag, compact tool roll, or in the built in admin organizer of your pack. In spite of that small size, they can be used to turn nuts (or round material) up to 1″ in diameter. They grip material so tenaciously that I have used them to turn nuts that were nearly completly rounded. The forward portion of the jaws lets me do fine work like gripping webbing to pull through a tight tri-glide, while the inner portions of the jaws are recessed to mate with nuts, bolt heads or round stock like pipes and caps. These have a place in The EDC Tool Roll because they are the pliers that I wish came in my multi-tool. I have purchased these locally from Sears Hardware stores or online from Amazon. See the Knipex Cobra Pliers at Amazon. Looking forward to this feature. After reanalyzing my carry and the tools I need, I recognized that I haven’t yet and probably won’t ever carry a multi-tool on my person. So if I’m carrying a bag of some kind anyway, I’m better served by a handful of small dedicated tools that just one of the many lackluster (and a few decent) multi tools that I’ve tried. Glad to hear that Aaron! They are available from a number of places both online and brick & mortar. I generally get mine locally at Sears Hardware or on Amazon (I added a link to the post). Where did you purchase it? Amazon has them for $30.39, which seems pretty pricey for a single pair of pliers, so hoping that you have a source with a better price. Jon, I updated the post with information about where I purchased mine. The first set came from Sears Hardware where I was actually able to lay hands on them and try them. The quality was plainly better than the adjustable pliers I was used to. The biggest upside to these is the machining of the jaws and how they are hardened to 61rc. I just about choked the first time I bought a Knipex tool. Now, with experience, I happily fork over the cash. There will be at least one more Knipex tool highlighted in this series… maybe two. I might have to stop by my local sears or hardware store to see if I can get some hands on time with a pair of these. Looking forward to more posts in this series. I guess it’s alot like EDC pens. Everyone’s jaw drops the first time they see the price of a high-end pen, and once you use/carry a few, you find one that you’ll never want to leave the house without. I had this same problem. Leathermsn makes/made a locking pliers multitool aka vicegrip that I’m trying out. I also bought some locking adjustable wrenches, but they’re too big. Take a look at Craftsman brand locking pliers. 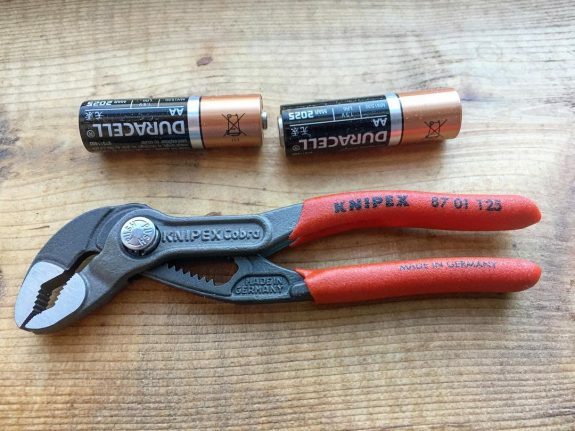 They are made by Knipex in Germany. Incredible tool without the knipex price tag when on sale. When I bought mine, Craftsman sold as a pair 1×7″ and 1×10″ for $35. Great tip! The Knipex made Craftsman pliers are excellent. I checked them to see if they had a 5″ version before buying the Knipex version. Unfortunately, I never found one so I went with Knipex. may i also suggest the channellock 424. https://www.channellock.com/424-straight-jaw-plier.aspx? just wanted to throw these in the mix. i have a pair from my father which were the child baby tooth extraction tool for my brother and i. there are several knipex pliers in my tool chest but not the baby cobra yet. Glad to have a series like this. can already tell it’s gonna be a classic like the “Tactical Handiman” series. Keep up the great work!